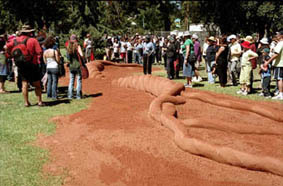 Four times during the Womadelaide weekend the Pitjantjatjara elders told their story along the length of the entire 30 metre long rope sculpture, sometimes to an audience of around two hundred people. Bernard Tjalkurin, Peter Nyaningu and Ushma Scales during story telling.
' the rope is a template for how to navigate life. In the microcosm the rope represents the double helix, the umbilical cord and the internal fibres of the body. On a personal level the rope represents the inner life of the self, of the individual. In the macrocosm the rope can represent the communities inside the suburb, the communities that make up Adelaide, South Australia, Australia and the world. 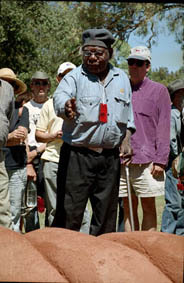 ANANGU - The first strand represents the people, the tribe and the community, which is made up of families, which in turn are made up of individuals. MANTA - The second strand represents the land. From the sea to the family farm. The suburban block to the ancient tribal land, The cubby house to the Murry River. KURUNPA - The third strand represents the spirit, the inner being, the personal view of God. 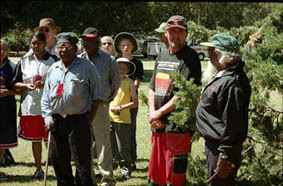 All three strands twisted together form the Tjukurpa, the Dreaming, the fabric of culture that holds our lives together. The rope represents the past generations, the present generations, and the future generations. By looking back at how life was lived traditionally in harmony, with all three strands tightly woven together, we have a model to attempt to fix the impact of civilisation on the rope today - on all of us. The past is seen as unchanging, small impacts on the fabric of life. The rope is strong and binding and moves with predictable changes.As life moved into the twentieth century the impact on the strands, Manta, Anagu and Kurunpa increased dramatically. The rope is a tangible, touchable metaphor for our personal and community life. A lifeline from the past to the future. A model for everybody, now and forever."